Brain measurably loses function starting as early as age 45. Many otherwise healthy adults will lose a full 50 % of their brain function. People whose mental powers are significantly declining tend to experience a greater number of negative moods and withdraw from friends. Sorry, Virgil. We need more memory than ever or else how will we recall where we parked our car in enormous mall lots, telephone numbers, nine-digit zip codes, security passwords, home and car alarms, credit card CRVs, driver’s license and social security numbers, bank accounts, birthdays, anniversaries—and God only knows what else our human computers will be asked to store in our memory. Scientific evidence indicates that the ability to perform everyday memory and learning tasks need not diminish over the adult life span. The keys are proper diet, exercise, lifestyle habits, attitude and use of key brain-protective and memory-enhancing supplements. It is not surprising that experts have found the brain measurably loses function starting as early as age 45. Many otherwise healthy adults will lose a full 50 % of their brain function related to memory, learning and concentration over the course of their lives. A recent survey of 1,000 French adults found that two-thirds complained of memory problems. These problems are becoming more and more common in the 35 to 50 age group. Psychologist John Barefoot, of Duke University Medical Center, reports that in a study, which began in 1964 and followed people for several decades, those persons with the highest scores for despair, poor self-esteem, difficulty concentrating and low motivation had a 70% higher risk of heart attack and 60% higher risk of overall death compared to men and women with the lowest scores. 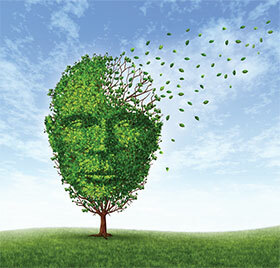 “I have become convinced that much of the functional [brain] loss we see with advancing age is related to factors we ... can control,” notes Parris M. Kidd, PhD, biomedical nutritional consultant whose current research has focused on the potential of nutrients to slow age-related mental function. Another key reason for supplementing with antioxidants is to prevent blockage of the arteries (atherosclerosis). Although many of us have long thought of this condition as a risk factor for heart disease, arterial blockages also reduce blood flow to the brain, which results in less oxygen and nutrients reaching cells. Such blockages increase the risk of blood clots which can cause strokes. Antioxidants help to prevent cholesterol from becoming oxidized and forming deposits in the arteries. Food additives. Some food additives, such as artificial colors, contain lead which impairs mental function. Other types of food additives, known as excitotoxins, can actually kill brain cells; examples are monosodium glutamate and aspartame. Alcohol. Alcohol intake can result in destruction of brain cells and cause long-term irreversible brain damage. Hazardous chemicals. Household cleaning products, paints, auto products, and home and garden pesticides often contain toxic solvents and other chemicals that damage the nervous system. Ginkgo biloba, when purchased in its standardized extract form, is known to stimulate circulation and oxygen flow to the brain; this, in turn, improves problem solving and memory. A French study “confirmed the efficacy of [ginkgo extract] in cerebral disorders due to aging.” Many other studies have demonstrated significant improvements in all tests of mental function including mobility, orientation, communication, and mental alertness. • Is safe to take and has negligible adverse effects. Acetyl-L-carnitine (ALC) is formed by acetylation of the amino acid carnitine via an enzyme called carnitine acetyltransferase. ALC can be freely exchanged across membranes and can provide acetyl groups from which to regenerate acetyl-CoA, a vital memory nutrient. ALC was first considered a vital memory agent because of its structural similarity to acetylcholine, reports The Annals of the New York Academy of Sciences. The abstract for this report further observed that experimental studies demonstrate that ALC promotes acetylcholine synthesis and release. Furthermore, ALC protects the aged mitochondria, the energy factories of cells. Huperzia serrata, a moss which has been used for centuries in China for symptoms of confusion and memory loss, is gaining attention for its alkaloid compound huperzine A (HupA), a selective acetylcholinesterase inhibitor that has similar action to the two drugs currently approved to treat Alzheimer’s disease—tacrine (Cognex) and donepezil (Aricept).